Among the many papers I had passed to Frank that day were copies of original letters, in his handwriting, along with government CCC records detailing his 1935 CCC artist enrollment with Company 1675-V, at Camp Swallow Cliff; “one mile north of Palos Park and ten (10) miles west of Blue Island, Illinois.”. In one letter Frank responds to official questions which challenged the colors he used for his CCC paintings by explaining. . . “I was handicapped at the time because of my inexperience in painting complicated compositions.”. . . In many respects those complicated compositions were a whole other world; the CCC, by a new recruits definition, was a strangely unfamiliar and disorienting environment. 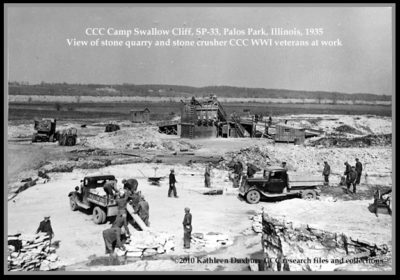 Company of CCC enrollees from Camp Swallow Cliff, Palos Park, Il. at work in the limestone quarry, stone crusher in background. Camp Swallow Cliff was not a typical CCC company of junior recruits; boys who would have been close in age to Frank. This was a group of hardened World War veterans; hardened by the cruelties of war and then the economic collapse and wide spread unemployment caused by the Great Depression. As Frank would soon discover the CCC work projects, in the Cook County Forest Preserve, were varied and consisted of long, labor intensive days. As Frank was reading the papers, he fanned them out a bit; acknowledging the hand writing and words. Slowly Frank lifted his head, gently shaking the papers saying . . . “I am starting to remember” . . . and remember he did. What followed was an exciting afternoon of unhurried memories, some vividly recalled … a naive young man, out of his element, whose encounters with injured war veterans left lasting, haunting impressions … descriptions of the work projects … the barracks … numbers painted on the side of a truck used in a local quarry . . . the cutting and crushing of stone. These observations all came to life in the oil, watercolors and pencil drawings Frank made during his 1935 CCC assignment. Frank was an young, untried artist when he arrived at the racially mixed Swallow Cliff CCC camp in the spring of 1935. Because of his special status as Artist/Enrollee, he was exempt from labor and fatigue work. Artists were instructed to spend each 40 hour work week depicting the life and work of the CCC in whatever medium they preferred. 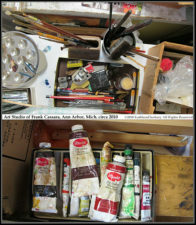 During Franks enrollment there were at least two shipments of art sent to Edward Rowan, Asst. Director – Section of Painting and Sculpture, Treasury Department in Washington, D.C.
Frank was Honorably Discharged shortly before the end of the enrollment period, in September 1935. He was provided transportation back to Detroit, where he faced, once again, the same jobless situation. With no promise of employment he considered himself a burden to his family. Five months had passed, it was winter, and he was desperate for any job, whether it be with the art programs or from the local government employment agency. In trying to get on the local projects he was so persistent in seeing people he was ejected (from the agency office). Not knowing what else to do Frank wrote to Olin Dows, National Director of the Federal Art Project (FAP) and Edward Rowan, Asst. Director of the Treasury Department Section of Painting and Sculpture pleading for work on their projects. Both Rowan and Dows, aware of Franks talents, were unable to offer any work; there were no openings. They both suggested he apply for relief status or consider re-enrolling as a CCC artist. Rowan requested Frank let him know of his decisions and his offer “to aid you in any way that I can” was sincere. By 1937 Frank Cassara did find employment that would continue for years with the federal art programs… murals at the Thompson School in Highland Park, and the Water Conditioning Plant in Lansing. In addition to Post Office murals, one titled Early Settlers, 1940 tempera in east Detroit, and Cattle Auctions, 1942, oil and tempera, in Sandusky, Michigan. Frank would become the Michigan supervisor of the Works Progress Administration (WPA) Federal Art Project (FAP) easel division. After December 7, 1941, and the entry of the United States into WW II, government work relief programs, which included the CCC, WPA/FAP and other art programs would soon cease. 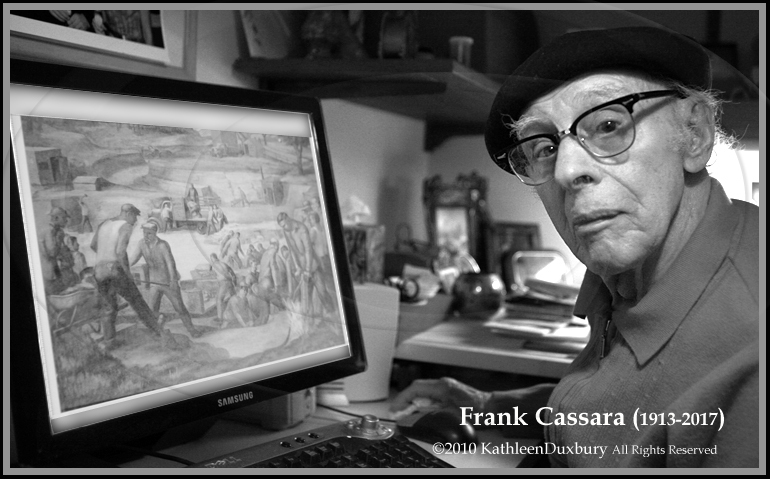 Frank Cassara served as an Artist with the Army branch of Engineers in the American and Asiatic Pacific Theater, returning to Detroit in 1946. From 1947 – 1983 he was a beloved Professor of Art at the University of Michigan’s, Penny W. Stamps School of Art & Design. Let the record show and add CIVILIAN CONSERVATION CORPS ARTIST to Franks Cassara’s impressive list of New Deal achievements. Understanding that my focus is on the CCC art program I would stay in touch with Frank during my travels and research; occasionally sending him pictures or documents pertaining to CCC Camp Swallow Cliff. my heart skipped a beat when I saw an envelope with the Cassara return address. Time spent with Frank Cassara are hours which remain highlights of the CCC Art Projects research. I am grateful for the generosity of Frank Cassara and family for allowing me to visit, to learn, to question and better understand the experiences of a young untried artist assigned to depict the life and work of a World War veterans CCC camp during the cruelest years of the Great Depression. 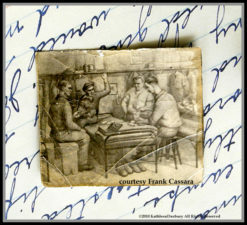 I met Frank in the 1980’s when he was making his own “paper” and enjoyed a visit to his studio. We saw each other several times and our conversation lead to the discovery that he had worked with my cousin Henry Bernstein (who became a well known illustrator) on the Lansing Post Office art in the 1930’s. Frank was a delightful gentleman and I thoroughly enjoyed the time spent with him. Kathleen, What a beautiful touching human interest story. Keep up the good work.